The city of Manta is one of the most popular tourist destinations in Ecuador with great beaches and great tour operators offering water sports and a variety of trips and activities. Manta is home to Ecuador's largest seaport, which means that it is one of the important commercial hubs in the country. With the ability to house so many large ships it's a popular stopping point for cruise ships. The main industry in Manta is tuna fishing, and the catch of the fishing fleet from the city makes it a great place to enjoy seafood. Manta is on the central east coast of Ecuador and is the second largest city in the area behind Portoviejo, which is located inland of Manta. While the city enjoys several beaches, as you travel inland from the city itself the terrain becomes a dry tropical forest. The coastline in Manta is frequently hit with quite big waves from the Pacific Ocean, which has led to the city becoming a popular destination for watersports, with the San Lorenzo and Santa Marianita beaches both enjoying good wind and wave conditions most of the year. One of the main reasons that visitors come to Manta is for the spectacular water sports, and like much of Ecuador's east coast surfing is a particularly popular pastime. Manta has been the host of several surfing and bodyboarding events, with the beach at San Mateo noted for having the longest waves for surfing in the country. Other activities that take place in the sea include kite-surfing and fishing, with several companies offering fishing charters to try and catch some of the big fish that can be found in the seas near Manta. Along with the water sports and spectacular beaches, Manta has several cultural attractions for visitors to enjoy, with an International Film Festival in January and an International Theater Festival in September among the regular events on the calendar. One of the popular side trips for visitors to Manta is to the nearby town of Montecristi, which is said to be the birthplace of the Panama hat, which is exported around the world. While the name of Manta's airport is the Eloy Alfaro International Airport, the flights into the city are purely domestic, with air links to both Quito and Guayaquil available. For those who are coming into Manta via an international flight into either Quito or Guayaquil, a cheaper option than a connecting flight to Manta is to take the bus, which is around seven hours from Quito or around five hours from Guayaquil. Once you are in Manta, it is a fairly easy city to navigate, with plenty of bus routes available and taxis are freely available and usually fairly cheap. As with anywhere in South America, make sure you negotiate the fare in advance, and try and carry plenty of small bills that will cover the fare. The climate in Manta has helped to make the city a popular tourist destination, with a long dry season which runs from May to December, when there is barely any rainfall, with the rainy season between January and April. The temperatures in Manta are fairly steady throughout the year, with the average high in the city between twenty-eight and thirty degrees Celsius throughout the year. 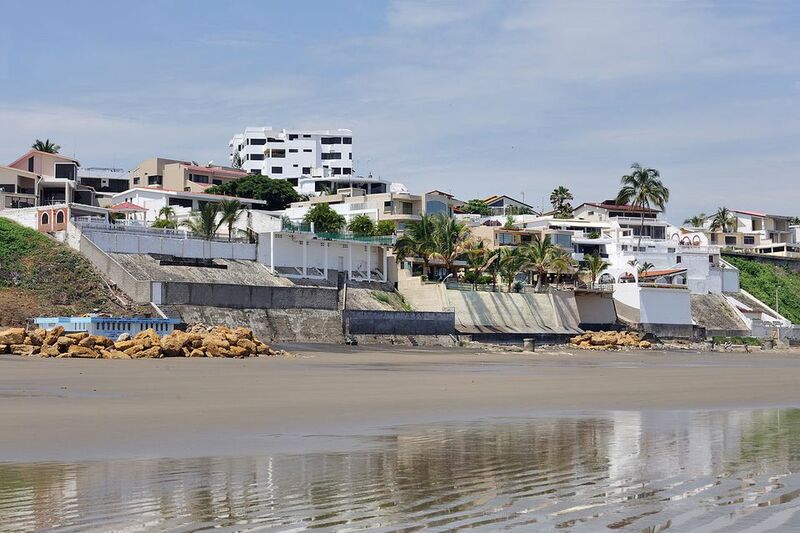 The popular beach area of San Lorenzo is located around twenty miles west of the city center of Manta, and as well as being a popular beach for surfing it is also one of the natural hot spots in the area. A large area of the forest around the beach has been protected, while visitors to the area between June and September can also take a boat trip to see the groups of humpback whales that migrate through the area during this period. The nightlife in Manta is also very popular, with several restaurants offering local specialties like ceviche and viche de pescado, which show off the excellent seafood of the city. There are also plenty of nightclubs and bars to enjoy, along with two casinos that are located within the larger hotels in the city.